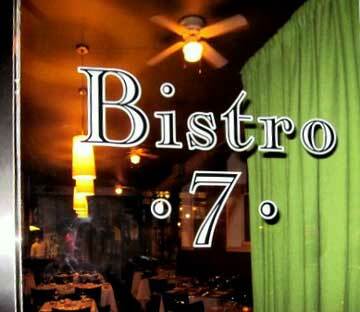 You feel de minimis just by entering into and under Bistro 7’s heightened ceilings and whirling overhead fans. A huge cylindrical silver air vent captures your eyes on the right, opening them wide. Its girth is big enough for bodies to hide in. Two windows appear mid-way to the floor below the ventilator, diverting your attention as your pupils dilate in the dimness. A pale pallor of green encompasses your peripheral vision, garnered from bare winter-grass-colored walls and matted plant-pistil-green panels. Silky ocean’s-bay-green mats are positioned atop roomy tables, about which you count a dozen (to seat forty). The “greenery” and tables are otherwise naked, but for the tiniest, incandescent, flickering, fire-fly faux candle-lights in the middle of each of said tables, encased squarely below translucent small glass marbles. They make the blandness seem sparklingly, opaquely magical. Michael O’Halloran is the chef-magician, whose bag of tricks had been displayed at White Dog and Fork before he and his wife, attorney Sophia Lee, ventured onto the stage of Old City. They entertain with foods grown by and acquired from local organic farmers, generating pristine prestidigitation, as the seasons allow. The chef’s platters grace and challenge your contemporary bistro-vision. For instance, order this appetizer: Burgundy-Braised Wild Boar Rillette ($13). "Life is like that," he responds cheerfully. "Let me call Mr. O’Halloran over here to explain the trick." “For the Wild Boar Rillettes, we take a Pennsylvania just-slaughtered wild boar’s shoulder and braise it ‘sous vide’ [in vacuum packing] with red burgundy, star anise, black peppercorns, garlic and onions at 180 degrees for anywhere from ten to sixteen hours, depending, of course, on the size of the shoulder. We remove the shoulder from the sous vide bag, strain and de-fat the cooking liquid and shred the shoulder with the clarified liquid, some butter and some rendered boar fat until it reaches a mousse-like consistency; and then season with salt and more cracked black pepper. We then portion the rillettes [the spread] into two ounce spheres shaped roughly like a cherry, and place them in the freezer. “For the cherry gelee, we caramelize sugar, complementing with rice wine vinegar to make a gastrique, adding morello cherry juice, astringent and sour; bringing the mixture to a boil while adding gelatin sheets and peppering. “To complete the boar, we take the frozen spheres and dip them in the still warm cherry gelee and return them to the freezer so it can set. We repeat this process eight more times to arrive at the proper coating thickness. 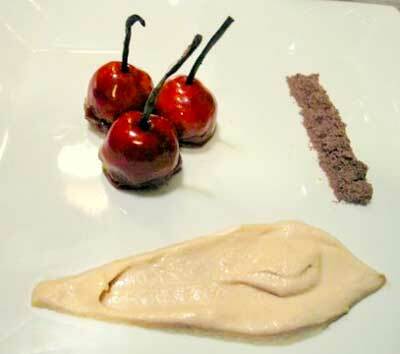 Finally, we finish the rillettes by placing a ‘stem’ of vanilla bean in the top of the sphere. I’m mesmerized. I’m ready to be placed in a box, sawed in half, displayed with my top and bottom halves separated twenty yards apart, and then reconstituted into one whole Jew. “What would you suggest for an Entrée?” I murmur mindlessly. As every lawyer learns, there is no trick for excellence: only arduous, detailed work works. Bistro 7 sets the bar.